Dorrance Eugene Richardson, age 68, of Green Forest, AR passed away on Sunday, March 17, 2019. He was born on October 3, 1950, in Twin Falls, Idaho to Dorrance True Richardson and Vonda (Smith) Richardson. 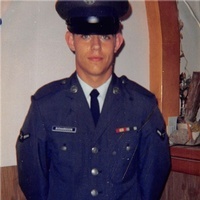 Eugene proudly served his country in the U.S. Air Force. On October 15, 2004 he was united in marriage with Mia (Goldsmith) Richardson. He and Mia were managers of the Forest Court Apartments in Green Forest for a number of years. In his free time Eugene loved fishing and collecting arrowheads. Eugene is survived by his wife Mia Richardson of the home, sons, Steven of Hobbs New Mexico, Tommy of Andover, KS, Brent of Alpena, AR, Marvin of Andover, KS, daughter, Wendy of Green Forest, 13 grandchildren and a number of great-grandchildren, brothers, Dave and Greg, sisters, Cristy, Kayla, and Marla. He is preceded in death by his grandparents, his parents, Dorrance and Vonda, father who raised him, Frank Butler, 2 grandchildren and 1 brother. Cremation arrangements have been entrusted to Smith Family Funeral Home in Green Forest.